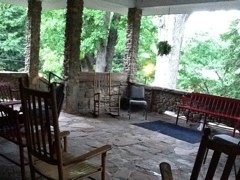 It’s a cool and rainy 68 degrees as I sit and blog on the porch of the Way Out building. We’ve had an interesting start to our day on this, our first day of classes. At around 7:00 this morning the electricity went out! I was hoping it was only in McGregor Hall, but it turns out to be the entire campus. The lovely staff in Howerton, however, had a hot breakfast ready for us, which was lovely. We were thinking maybe we’d be having Cocoa Puffs! One lovely thing about no electricity for me this morning has been that it has pushed me out to the porch, where I might not have landed otherwise, with the chilly rain and all. We’re looking forward to a full day of study and worship and music. More later.